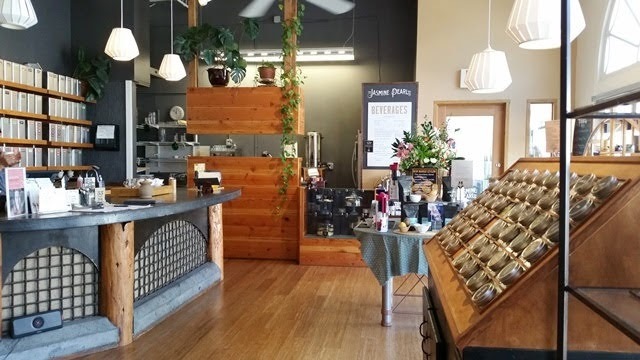 The Jasmine Pearl Tea Company has been in business for 15 years and their flagship tea shop has been a fixture in NE Portland for 9 years. 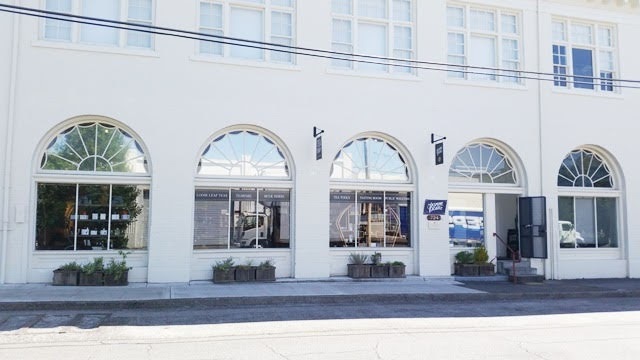 Shortly after my first visit in 2014, they made renovations. Recently, I had the opportunity to visit again to see the improvements and, of course, to stock up on tea. 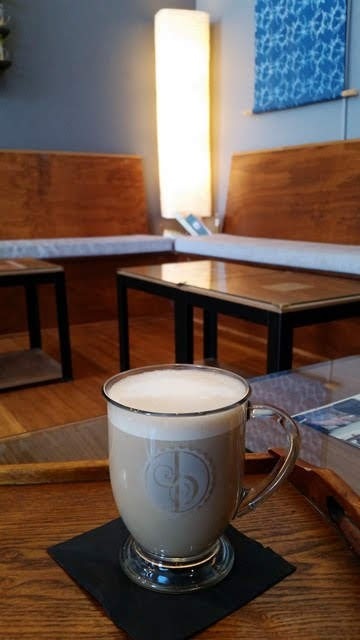 The interior of the tea shop is open and airy with plenty of light and a clean modern design. Jasmine Pearl offers an extensive selection of teas and teaware, including a number of pieces by local artisans. 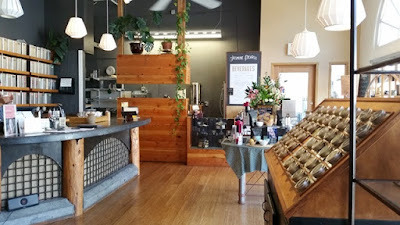 An A-frame sample rack provides customers with the opportunity to see and smell the teas their considering. 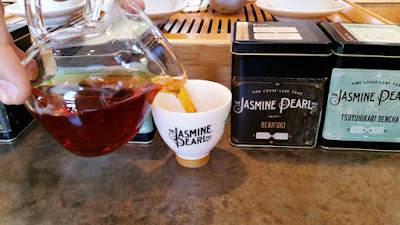 The tea shop also offers a selection of hot and cold beverages that can be freshly prepared and enjoyed in-house or to-go. 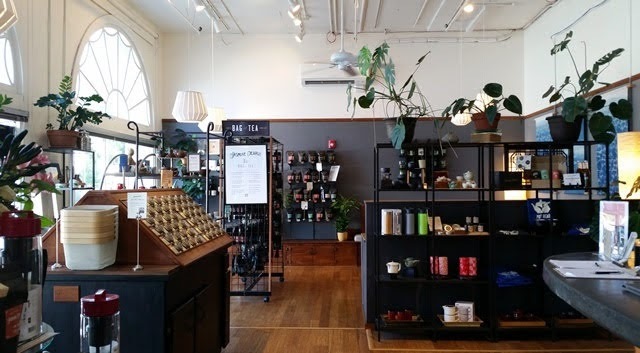 At the tea bar, customers will have an opportunity to taste the teas they're considering. For this visit I was interested in the Shinko Roasted Green and Tsuyuhikari Sencha, both produced in Shizuoka, Japan by small tea farmer Konishi Nobuyuki. 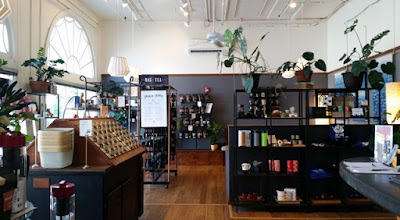 I was joined at the tea bar by another customer and was able to taste a few of their selections including Benifuki, Yuzu Green, and Yuzu Black. 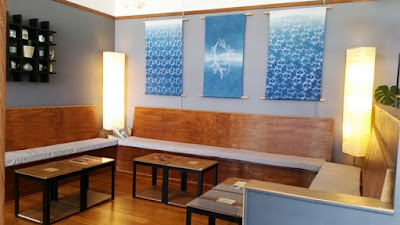 Beyond the tea bar is a comfortable banquette seating area where guests can relax and enjoy their tea. The weather was crisp and cool for this visit, so I enjoyed a warm and spicy Slow Simmered Ginger Chai. 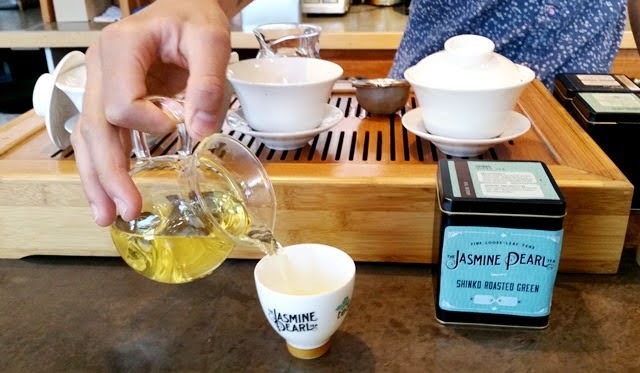 Jasmine Pearl hosts focused tea tastings as well as tea ceremony demonstrations and workshops presented by Margie Yap (Issoan Tea School) throughout the year. Follow them on Facebook to learn about upcoming events.